Mykonos has been for years one of the most favorite destination of the international gay scene, due to the lack of any kind of prejudice as to the sexual orientation of its visitors. The island honors its visitors with gay-friendly hangouts, where the freedom is absolute. The option vary from romantic piano bars at Little Venice to the most popular hotspots, where the party continues till the early morning hours. ⦁	LOLA BAR Feel like a star in this theatrical atmosphere, decorated with velver chairs, offering spicy cocktails. Lola Bar is a steady favorite of the gay community. Purple and fuchsia colors are dominant in the interior, while there is a yard with small tables for more relaxed moments. ⦁	BABYLON CLUB It is one of the hottest dance clubs in Mykonos. Uplifting sounds mix with mainstream hits with cherished oldies and theme parties are its classic values. The music is almost exclusively electronic dance, the mood exciting and the night always young. 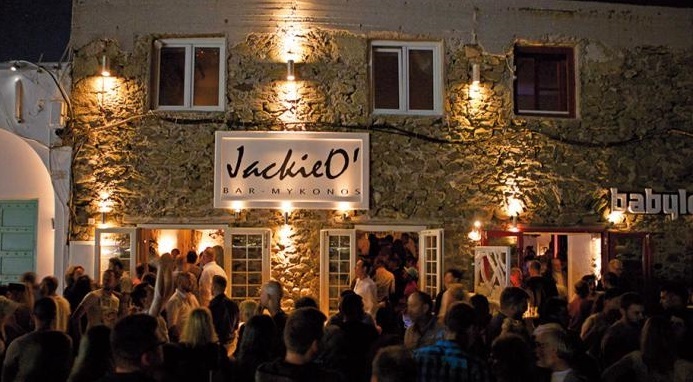 ⦁	JACKIE O’ BAR The all time classic hotspot is located close to Paraportiani church, near Mykonos old port. Renowned celebrities have dropped by but this place is exclusive and remains forbidden to paparazzi. The drag shows attract gay and straight crowds, while parties last till the break of dawn. ⦁	MONTPARNASSE PIANO BAR The romantic piano bar with cabaret show and excellent cocktails, operates more than 30 years in Little Venice. Various pianists and singers will parade during the summer and the show will begin! ⦁	PORTA BAR This is the most funky bar of Mykonos with pop aesthetics and colorful mottos on the walls, like “free your mind”. Relaxed and unpretentious, it consists of a number of small rooms that communicate and is ideal for your first drink setting of for the big clubs.